A significant number of reviewers were impressed by the comfortable ride of the Nimbus 19. Several loyal Gel Nimbus fans remarked that the latest version of this line offers its trademark cushioning and stability. More than a couple of heavier runners appreciated the support and cushioning of this shoe. Asics introduces its innovative FlyteFoam midsole technology in the 19th edition of the Gel Nimbus for better protection and responsiveness in an ultra-light foam. The shoe is substantially lighter than the earlier model. The gender-specific cushioning works to the distinctive advantage for both gender versions. There are already several color options to choose from. A handful of runners consider the shoe as very worth its price. The shoe does not require any break-in period, according to a few runners. Reflective elements for low-visibility running. A good number of Asics Gel Nimbus fans were very disappointed that the new version is very tight around the toe box. A handful of runners noted how small and narrow, the latest iteration of the Nimbus is. A handful of runners were very disappointed by the shoe’s outsole durability. Asics’ flagship neutral shoe gets a ton of changes in the Nimbus 19. The shoe continues to be very well-cushioned with an added emphasis in midsole protection and responsiveness. Most of the reviewers were generally impressed by the comfortable feel, good arch support, the drastic drop in weight, and bang for the value price. It remains to be one of the shoes that runners are very excited about from Asics as the year opens—and with sufficient reason to be. I tried to love this shoe. Parts of this shoe are pure heaven. And yet, there is one huge flaw. Why Asics? Why? This was my first pair of Asics Nimbus. I run 25-35 miles a week and have a severe heel strike. I have been running for years in Hoka Clifton 2 which unfortunately were discontinued long ago and replaced by Clifton 3 (not a fan) and the Clifton 4 (unaffordable at the moment). So after buying the last pair of Clifton 2 in my size about a year ago, I had to find a new everyday training shoe. I wound up with the Nimbus 19. What this shoe does right? The Asics Nimbus 19 has TONS of cushioning. As soon as you slip your foot in, it feels wonderful. The tongue is soft and cushy. The footbed is cushy. I love it. My Nimbus 19 has 200 miles on them now and still feels as cushioned and soft as on day one. I have not had a single pair of Clifton that I can wear for more than 250 miles. I expect I will be able to get at least another 100 - 150 miles (for a total of 300-350) on my Nimbus 19. What this shoe does wrong? OMG, the toe box! The toe box! The toe box! The toe box! In case you haven't heard it anywhere else, the toe box on this shoe is horrible. Honestly, the rest of the shoe is fine, great even, but the toe box RUINS it. It is cramped and tiny. Your foot will feel like the top of the shoe is pressing down oddly on it. It will feel like your foot can't move a millimeter. No wiggling of the toes, no movement at all. It's like a tiny toe prison. Oh, and it runs 1/2 to a full size small. But even if you size up, the toe box will just feel unpleasant, bruised toes unpleasant, wanting to cut the toe box open with scissors unpleasant. Other than the toe box issue (which again is huge and turns my toes black), the rest of the shoe is fine, if not great. I wear these for long distance runs and have no weird pains in my knees, back or legs after I run, as I've had in less cushioned shoes. My forefoot doesn't go numb. My heel feels great. I can't feel the road when I wear them, which I consider a huge plus. And they have enough traction feel stable on the dirt roads here. The Nimbus 19 is a maximal cushioned shoe with a plush heel and forefoot for protection upon impact. This is not a lightweight trainer but it doesn’t feel like bricks on your feet either. One of those shoes that you forget that you are wearing when you are running. It is a neutral shoe. The seamless upper has no places that rub or pinch. It is a shoe that needs no breaking in, it feels great right out of the box. It has a 13 mm heel to toe drop. It is a springy shoe that works great for both short tempo runs and long endurance training. Would I recommend the Nimbus 19? Yes, but with strong reservations. Definitely buy a 1/2 to a whole size bigger. And do not consider these if you have wide feet. If you tend to get toe blisters or can't stand a tight toe box, avoid these. If you are looking for a maximalist shoe that will hold up for 200+ miles, give them a try. I have a love/hate relationship with my Asics Nimbus 19. I get mad at these shoes for hurting my toes, throw them in the back of the closet then a few days later, pull them out and do my long runs in them and remember why I love them. When I first started running over a year ago, I didn’t know how important it was to have the right shoe. I finally realized why people spent good money on running shoes and why they were so different than just fancy boy shoes. 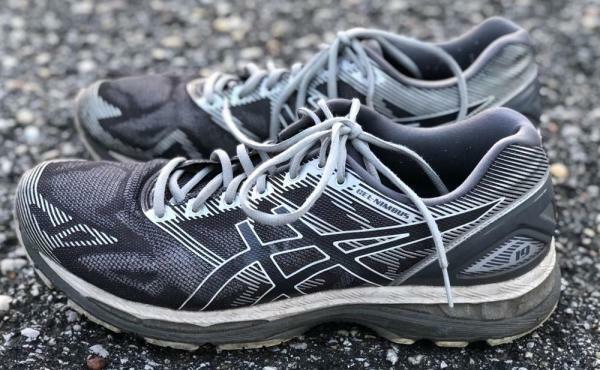 With me starting to have the miles add up in training, I needed a shoe that would help my feet go the distance, and the Asics Nimbus 19 delivered. With them being my first pair of purposely bought for running shoes, I was ready to become a runner. What drew me to the Nimbus 19 is how they fit my feet the first time I put them on. Yes, the toe box and forefoot is narrow but that’s just another thing I love about it. When trying on the Nimbus 19, I also compared it to its predecessor the Nimbus 18. The Nimbus 19 had a snugger feel on my foot, adequate cushion, and felt firmer which won me over. For me, I didn’t have to break in these shoes. I was able to start logging long distance runs immediately. What I also liked about these shoes is that they are very breathable, my feet don’t feel as hot and sweaty when finishing up a long run as they do with some of the other shoes I have. As for looks, the Nimbus 19 come in a few colors. I opted for the Carbon white and silver which goes better with most of my running gear. I personally don’t like my shoes with wild flashy colors. The Nimbus 19 has held up pretty good for the 320 miles I have put on them. The upper and lower have not had any issues with splits or tears. Out of the 300 plus miles, they have varied from long easy runs to 5k fast pace race days. The cushion has held up fair and after around 240 miles, I could tell it was starting to fade. Normally on average, people have seen around 350 miles out of a pair of Nimbus 19. After buying another new pair of Nimbus 19, I realized how much the cushion had faded. The Asics Nimbus 19 has a narrow fit and firm feel, which is not for everyone. After long training runs on pavement, my feet do not feel sore. I have a few different pairs of running shoes I swap out for my different training routines, and these are probably my favorite. The grip on them has worked well for me even in the rain, I was able to do a 10k without any issues. I have done a few trail runs with them but I wouldn’t recommend it for trails. Also, because of the material of the cushion, the shoe itself can feel a little heavy. Normally on my speed work days, I have to leave them on the floor. Lastly, because the Nimbus is discontinued and is now last year’s model, you can pick them up cheap. Because I have had good results using them for my long distance runs, I'm going to pick up a few extra pairs. I have yet to try on the Nimbus 20, but for me, Asics did a great job on these shoes and I look forward to future models. I love the color and the design on the side of the Nimbus 19. I was very picky when deciding on what style to get for these shoes, and had to search a bit to find the color I wanted, but it was worth it. The Asics Gel Nimbus 19 is amazing. 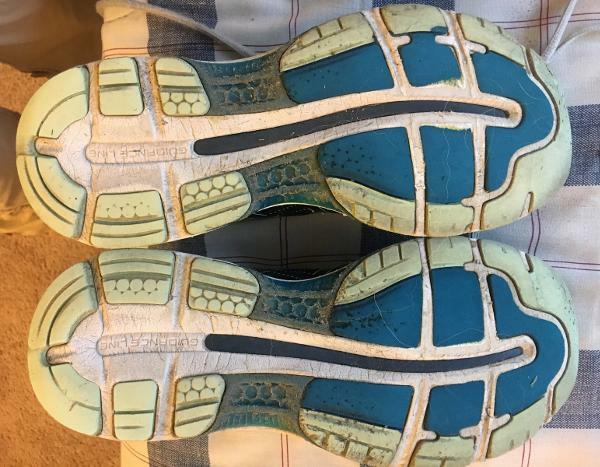 I have worn them for both running and walking much more than the 600 miles at which it is recommended that you retire the shoe, and they are barely showing any signs of wear and tear. I tend to pronate, especially on my left foot where the arch has begun to fall, yet when you look at the tread on the bottom, both shoes still are relatively intact - this is something that has not happened for other shoes. The shoe also does well in the wash in case you need to clean it up after it has endured some battles with the rain and the mud. Despite having gone through the washing machine multiple times, it has retained its form and not broken down like some other shoes I have owned. It cleans up nicely and usually dries fairly quickly without the use of the dryer. On the downside, a minor flaw seems to be the shoelaces. The ones that came with the shoes quickly began to fray in the middle, and even after being replaced with another pair, quickly deteriorated again. This could be due to the fact that I lace the shoes up tightly - but I have never had this issue with another shoe before. I have a foot that is a half size smaller than the other, which means that I always have a difficult time finding shoes which fit both of my feet relatively well in the same size. Because of the cushioning and adjustability of the shoe, I have not had any issues or problems with them. I also have very narrow feet. While I do have to lace the shoes up tightly to make sure they are snug, they are still comfortable and breathable. I initially laced them all the way up to the top as I have with previous shoes to ensure that my heel was not coming out of the shoe when walking/running, but discovered that this was unnecessary as just using the bottom holes of the shoes was sufficient. In terms of size, I usually wear a 9.5 but have found that for most Asics models I need a size 10. While I can fit into a 9.5, wearing the 10 gives me more toe room to avoid blisters and lost toenails, and still provides a snug fit, without wasted space. I was hesitant the first time and got a smaller size, but later returned the shoes for a half-size larger. The Gel-Nimbus was actually recommended to me by my sports medicine doctor after several injuries. Billed as a neutral shoe, I was a bit hesitant as the price was initially more than I usually spend on a running shoe, but the cost was well worth it. I have been injury free since using the shoe. The shoe is extremely comfortable, which is why I have used it both as a walking and running shoe. It is a versatile shoe which I have taken on trips and hiked over glaciers and mountains, as well as run over tracks and roads with. Even now after all those miles, the inside cushioning is still intact. I would absolutely buy the Asics Gel Nimbus 19 again. While the price was high, it has resulted in no injuries (and I am an injury prone athlete), is comfortable, and stylish. I recommend it to anyone who needs a neutral shoe and is concerned with nagging injuries and prevention. The Nimbus is quite nice for me. It's a neutral shoe. It's a long-distance shoe. It's comfortable and the 19 has become more comfortable. The Asics Gel Nimbus 19 features the new FlyteFoam Midsole technology that provides more cushioning without adding too much weight. Aside from the adaptive cushioning, this technology also delivers enhanced durability. The upper of the shoe was also updated. It utilizes a gradation jacquard mesh upper that provides a personalized glove-like fit and multi-directional stretch. With the updated last, the Asics Gel Nimbus 19 offers an enhanced and snugger fit in the heel area. The toe box is also more spacious than the previous model with added toe spring. Asics is offering the Nimbus 19 in both medium and wide widths for men’s and for women’s the shoe is available in narrow, medium and wide widths. It provides a comfortable fit and accommodates a wide range of foot measurements. Sizes available are 6 to 16 for men’s and 5 to 13 for women’s. The outsole unit of the shoe uses the Asics High-Abrasion Rubber that is strategically placed in the heel for durability. On the forefoot is the DuraSponge outsole that is also made from durable carbon rubber. Just like the Nimbus 21, this outsole material provides added flexibility and responsiveness while giving added durability. The Asics Gel Nimbus 19 has an improved midsole. It uses the new FlyteFoam Midsole technology that is designed to deliver an adaptive cushioning without adding weight. Aside from giving a responsive ride, this midsole technology also gives added shoe durability. The shoe also features the notable Asics Rearfoot and Forefoot Gel cushioning system that attenuates shock for a more responsive ride. This works perfectly with shoe’s FluidRide midsole technology that also promotes a resilient ride. The Nimbus 19 also uses the remarkable Guidance Trusstic System Technology that is designed to improve gait efficiency while giving structural integrity in the midfoot. The upper of the Asics running shoe features a breathable mesh upper with a seamless construction that reduces the possibility of irritation and blistering. It also delivers customized glove-like fit and multi-directional stretch. The shoe also features the ComforDry X-40 Sockliner that is anti-bacterial in nature and helps reduce odor. The sockliner also gives added underfoot protection. To provide a snugger fit in the heel and roomier toe box, the Gel Nimbus 19 utilizes a new updated last that also provides more toe spring for an enhanced running experience.